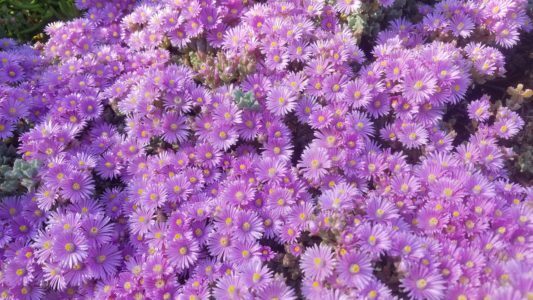 Highway iceplant is a succulent perennial groundcover with three-sided leaves that often forms deep mats covering large areas. 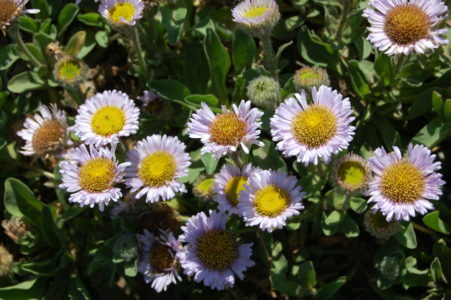 In California, it flowers nearly all year, peaking in late spring and early summer. 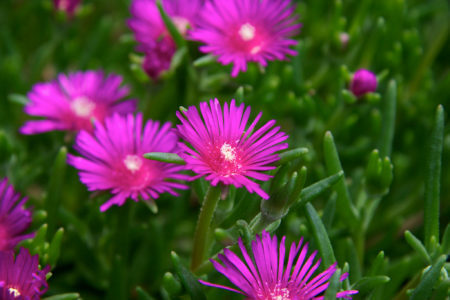 It can hybridize with, and is easily confused, with its close relative Carpobrotus chilensis, which has smaller, deep magenta flowers. 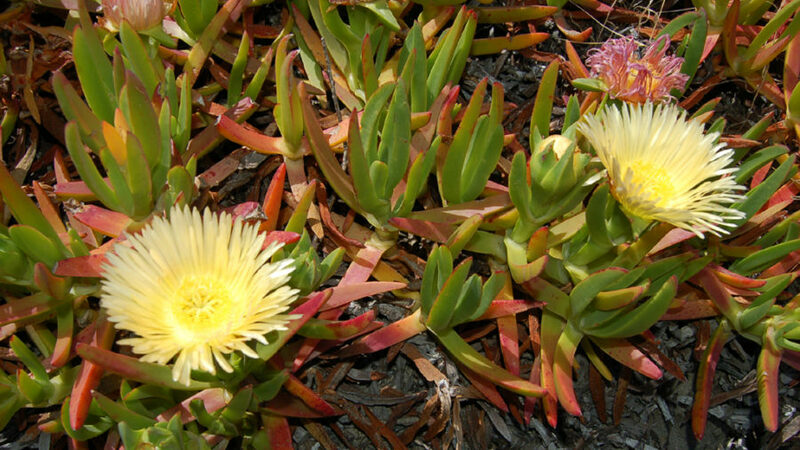 Carpobrotus edulis is native to coastal areas of South Africa, which has a climate similar to coastal California. It was brought to California in the early 1900s for stabilizing soil along railroad tracks and was later used by Caltrans for similar purposes. 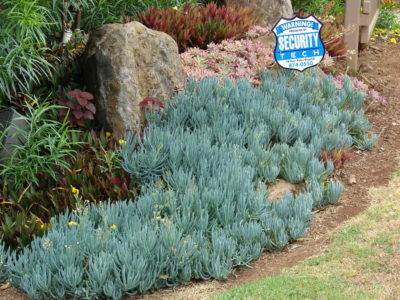 It has also been used as an ornamental plant for home gardens. How does highway iceplant spread? 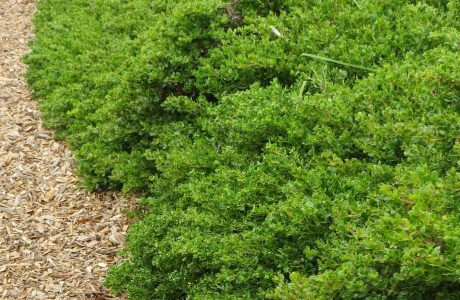 Individual plants can expand more than 3 feet in diameter per year, spreading to at least 165 feet in diameter. Any shoot segment can become a new plant, so it is important to remove all material from a site. It can produce hundreds of seeds per fruit. Fruits are often eaten by mammals such as deer, rabbits, and rodents and are spread in their droppings. It establishes well after the ground is disturbed. 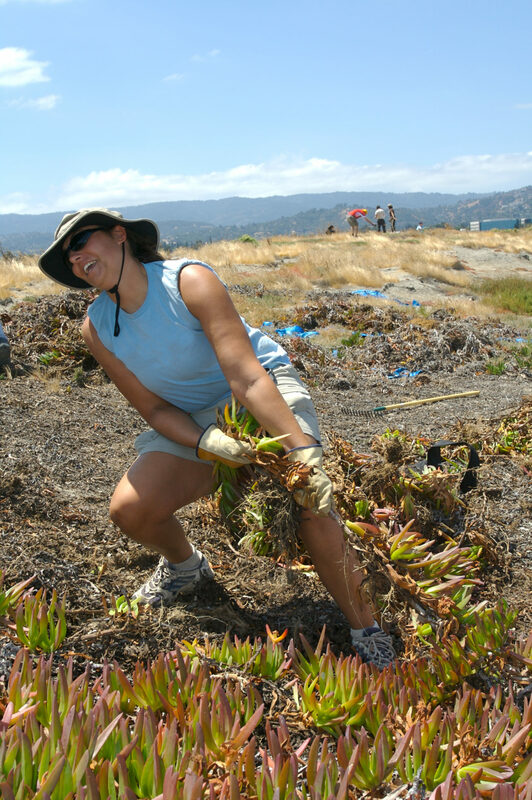 Where is highway iceplant found? Carpobrotus edulis occurs along the coast from north of San Francisco all the way south to Mexico and on the Channel Islands. It mostly colonizes coastal bluffs, but can colonize grasslands up to 8 miles inland and invade areas disturbed by grazing. 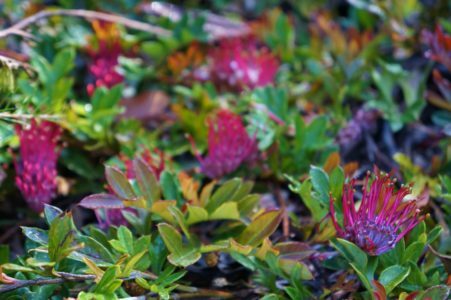 It invades coastal grassland, coastal scrub, dunes, coastal bluff scrub, maritime chaparral, oak woodlands, and the margins of wetlands. What problems does highway iceplant cause? 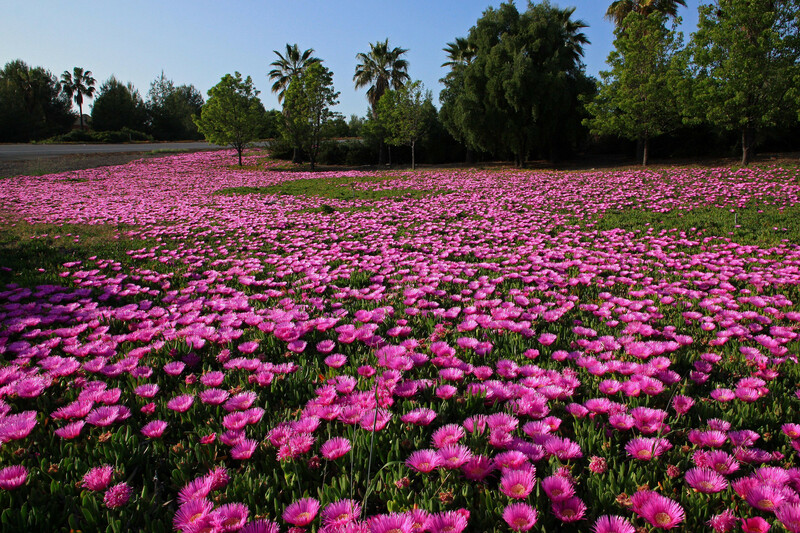 Carpobrotus edulis increases soil salt content and blocks light for other species. 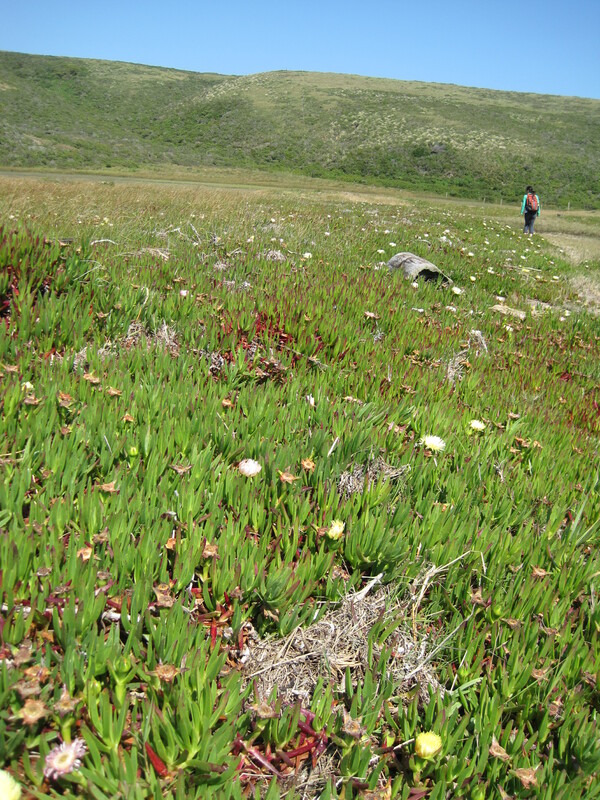 Salts released by iceplant favor salt-tolerant species (like itself) while inhibiting grasses. 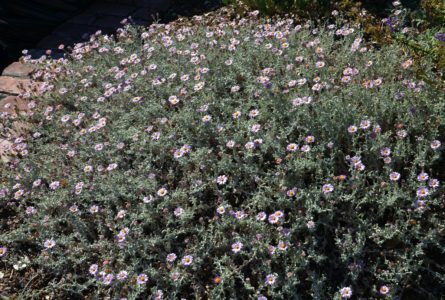 This decreases the density and cover of annuals. The plant decomposes slowly, leaving biomass in place for several years. 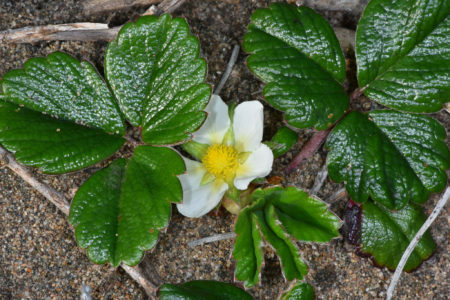 The build-up of organic matter they cause in sand dunes can result in invasion by other non-native plants that normally would not be able to grow in sand. It also stabilizes sand dunes, which alters the natural process of sand dune formation and movement.